The avalanche of bitter comments on the Party of Democratic Action (SDA) announcement that this party will launch an initiative to challenge the name “Republika Srpska” continues. 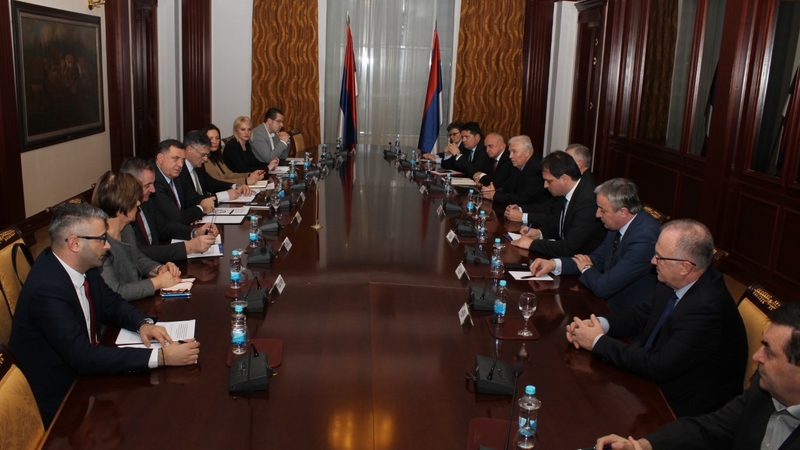 The Alliance of the Independent Social Democrats (SNSD) and actual Chairman of the Bosnia and Herzegovina Presidency, Milorad Dodik, called presidents of all parliamentary parties in RS National Assembly on a meeting to prepare a unified answer on the SDA initiative. The meeting was held in Banja Luka, Republika Srpska capital, with the participation of all leaders, regardless of their political space. In the joint statement, they estimated that the possible submission of the SDA initiative as an appeal to the BiH Constitutional Court, would be seen as an unconstitutional move that opposes the Dayton Peace Agreement, and which aims to abolish RS. “If the Constitutional Court accept this appeal, we will consider it a flagrant violation of the Dayton Peace Agreement and we will call for a session of the RS NA in which we will decide on the future status of the RS”, Dodik said, reading the joint statement. Speaking on behalf of all the parties present at the meeting, Dodik said that this appeal represents a slap to the integrity and sovereignty of BiH since the establishment of the Dayton Peace Agreement. “The General Framework Agreement for Peace in BiH confirms the name of Republika Srpska, which is clearly indicated in Article one, paragraph three of the BiH Constitution, which defines that BiH consists of Republika Srpska and the Federation of BiH”, Dodik told reporters after the meeting in Banja Luka. In an attempt to soft pedal the situation, SDA leader, Bakir Izetbegović, said on Thursday that the initiative would not be submitted if “SNSD changed its behaviour on the political scene in the next six months”. He repeated that Republika Srpska cannot be the exclusive entity for one nation and that other constitutional nations must be included. The SDA leader stressed that it is time to say that it is enough because “the RS is based on human bones and on genocide, but is accepted in order to establish the peace in BiH”. “We (Bosniaks) did not accept it to be an entity in which one nation will dominate and humiliate people”, Izetbegović said. Russian ambassador to BiH, Peter Ivancov, called other partner countries in the Peace Implementation Council BiH to hold an extraordinary meeting, raising the problem at a higher level. The EU Delegation to BiH issued a short statement calling all political parties to refrain from political manoeuvres aimed at distracting attention from the real issues Bosnia and Herzegovina is faced with. “Polarising statements and actions, including challenges to the constitutional framework of the country, will not facilitate the formation of new authorities at a crucial moment for the country’s EU path. We reiterate our urge to all political parties to engage in a constructive manner to ensure the implementation of election results, in order to move ahead with much needed reforms”, reads the statement. Even International community High Representative to BiH, Valentin Inzko, expressed his position on the issue, emphasizing that the Constitution of Bosnia and Herzegovina recognises that Bosnia and Herzegovina consists of two entities, the Federation of Bosnia and Herzegovina and Republika Srpska. He underlined that the PIC Steering Board has repeatedly expressed its commitment to BiH’s fundamental structure as a single, sovereign state comprised of these two entities. “In this respect, the announcement of an initiative to challenge the name of Republika Srpska in front of the Constitutional Court of BiH in the midst of discussions on government formation is irresponsible and counterproductive, and further undermines the trust between constituent peoples and their political representatives”, Inzko says in written statement.